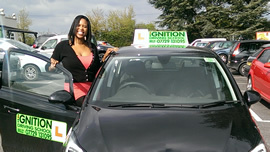 Ignition Driving School has a fully qualified, female driving instructor covering Redditch and nearby Bromsgrove. Redditch is a fairly new town and was developed initially to help with easing the pressure on Birmingham, which was becoming overpopulated. Famous for making needles and fishing tackle, the Forge Mill Needle Museum in Redditch has exhibits of Redditch’s industrial past. Taking driving lessons for the first time can sometimes feel like searching for a needle in a haystack – an impossible challenge! Rest assured though all our driving instructors are patient and are there to make your driving lessons as enjoyable as possible. The driving test centre is in Redditch too so you should be familiar with the test areas as you will be learning in the very heart of those driving test areas. From the start of your course of driving lessons in Redditch until the day you pass your practical driving test, Ignition Driving School will be there to help you all the way. To help you with your theory test you can make the most of our online pupil centre, The Hub, with unlimited number of theory papers for you to practise. We also provide mock driving tests too so that you can see how you would fair on a real test. No matter what your ability is Ignition Driving School has a course that's right for you. From hourly driving lessons in Redditch to intensive driving courses, Ignition Driving School can help you on your way. Fantastic.Just passed my driving test 1st time thanks to Milly Dixon my instructor. From my 1st lesson Milly put me at ease and made me feel very comfortable in the car. Her instruction and explanations were very clear and easy to understand and Milly was brilliant at helping me overcome my mental blocks. If you really want to pass your test 1st time like I did then I would definitely recommend Ignition Driving School and if you're lucky enough to get Milly then you should look forward to passing your test 1st time.Thanks again Milly. To see our prices or to book a driving lesson in Redditch simply click on the Quick Links below.